One of the two firms aiming to commercialize Elon Musk's vision for the future of travel has announced that it has exclusively licensed 'passive magnetic levitation' technology in its prototype. Hyperloop Transportation Technologies says that this system is both cheaper and safer than traditional maglev technology, which is already in use around the world. The passive variant was invented in 2000 at Lawrence Livermore National Labs by a team led by the late physicist Richard Post. It uses no superconducting or powered magnets, instead relying on unpowered coils of wire embedded in the track and permanent magnets in the train to create levitation. "I had the honor of meeting with Dr. Post in 2014 prior to his passing," said Dirk Ahlborn, CEO of the Hyperloop Transportation Technologies. "He saw the Hyperloop transportation system as the perfect fit for this technology and was excited to see it become part of the project." "From a safety aspect, the system has huge advantages," explained Bibop Gresta, COO of the firm. "Levitation occurs purely through movement, therefore if any type of power failure occurs, Hyperloop pods would continue to levitate and only after reaching minimal speeds touch the ground." He added: "Utilizing a passive levitation system will eliminate the need for power stations along the Hyperloop track, which makes this system the most suitable for the application and will keep construction costs low." The announcement was made about 48 hours before the similarly-named rival firm Hyperloop Technologies Inc. planned to show off its technology to reporters. Both firms are competing to be the first to build a real, working Hyperloop. 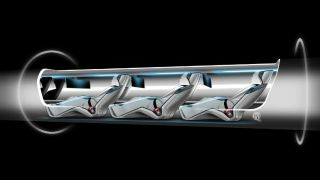 Musk's firm SpaceX is also building a Hyperloop track of its own. Hyperloop Transportation Technologies also recently showed off a concept design for augmented-reality windows to ease the boredom of travel.